There has been a slow but steady rise in tech companies getting major sports broadcasting deals worldwide. Facebook just announced a little noticed deal for £200 million to exclusively broadcast all 380 English Premier League (EPL) matches for 2019-2020 season in four Asian countries, Thailand, Vietnam, Cambodia and Laos. 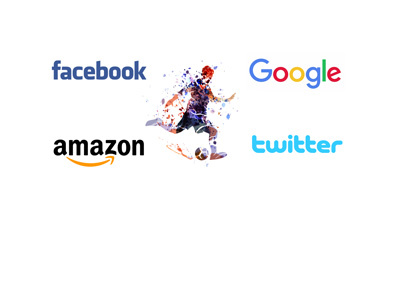 Looking at these four countries one might think that this a side-deal for Facebook, however at the same time it shows what could be the making for the future of sports broadcasting as social media and internet platforms look to tap into this rather lucrative market. However, some unknowns remain and those are keeping the likes of Facebook, Google, Twitter and Amazon from dishing out big money which the traditional media has been doing understanding very well, and that is that the sports broadcasting is a major source of revenue and clients. How are the social media and internet platforms entering this lucrative market? Facebook started by signing an exclusive broadcasting right to Major League Baseball Wednesday afternoon games. And while this contract is rather small, costing Facebook $35 million to broadcast 25 games, it shows that the social media platforms are indeed heading into direction of competing with the traditional broadcasting powerhouses. Still, the last bundle of broadcasting rights for MLB was estimated to cost $6.5 billion cast, not sure Facebook is in that state of mind yet, however with their activities in sports thus far, it appears that this is an industry they are diligently looking into and a question of a more aggressive entry into this market appears to be only one of timing. Other deals that Facebook has already signed, and which show the direction of social media's broadcasting ambitions involve deals with Fox Sports to stream soccer's UEFA Champions League and with Univision to stream live games from Mexico's top soccer league, Liga MX. Facebook had non-exclusive rights to 20 MLB games last season, as well as 47 college-basketball games this past year. It also streams one exclusive WWE event per week. Facebook's biggest move yet came in a failed attempt to get the rights to Indian cricket matches. Though the company lost out on the rights, the move highlighted just how global Facebook is thinking and how much money it is willing to spend. Facebook's losing bid was $600 million. Reports are suggesting that the Facebook is assessing the best approach to becoming a significant player in the sports broadcasting and the EPL deal signed in the four Asian countries could certainly be a testing ground for something much bigger to come out of Facebook in times ahead. Hiring of former Eurosport chief executive, Peter Hutton, to run Facebook's new global sports-rights-buying business shows the ambition that Facebook has into making a significant impact going forward. The other social media and internet platforms are also making inroads into this market segment. Twitter entered the world of sports broadcasting with streaming rights to NFL Thursday night games in 2016. Amazon bought those same rights for 2017/18 season, while the bidding for 2018/19 season is being auctioned with Twitter, Amazon, Google and Verizon all in the running. Twitter also won a package of MLS gamess with a three-year contract which includes a slate of weekly programming including at least 24 live matches per season. Google's YouTube has also added Major League Soccer rights, including streaming rights for the Seattle Sounders soccer club. The deal between YouTube and the MLS's Los Angeles F.C, is even more complete - with YouTube having exclusive ownership of online and broadcast rights. In the U.K., Amazon has been making several inroads into the sports arena in order to make its Amazon Prime Video a go-to destination. It also acquired rights to the ATP World Tour tennis, which were previously held by the satellite broadcaster Sky, and the rights to the U.S. Open. Tech media platform slow entry into sports media rights seems to be a deliberate one since tech companies aren't necessarily able to make expensive sports rights into a profitable business just yet. Sports leagues however face risks of their own as well when it comes to making deals with the internet media platforms. Even though there may be tech companies willing to write big checks, there is some doubt as to whether a sports leagues will be willing to risk reaching a smaller audience by putting content onto platforms that are still learning to attract sports viewers. But as TV viewership declines overall, some sports leagues could end up turning to tech platforms indeed and these small inroads seem to be a precursor of things to come. A good example is Ultimate Fighting Championship which has had a tough time getting its asking price for its broadcasting rights. UFC President Dana White said the company would consider going digital. One thing is for certain, the preference of younger viewers is to use social and internet platforms rather than the traditional TV viewing, which in turn should lead to sports broadcasting finding the ways to engage the younger viewers through their favorite media platforms. Whether that will be a combination of joint bids by traditional broadcasting houses and new tech platforms or whether they will go ahead and compete against each other remains to be seen.